Loren Goldner on the history of the Korean working class during the past 20 years. Similar to patterns that have been played out in Spain and Portugal (1974-76) as well as in Brazil (1978-83) since the mid-1970’s, the Korean working class in the late 1980’s destroyed the foundations of a decades-old military dictatorship with remarkable mass strikes in the years 1987-1990. The strikes resulted in the creation, briefly (1990-1994) of radical democratic unions and in high wage increases across the board. But, as in other cases, the working class was relegated to the role of battering ram for a “democratic” political agenda that quickly embraced globalization and the neo-liberal mantra of free markets. In fact, even before the strike wave but particularly thereafter, Korean capital was already investing abroad and pushing neo-liberal austerity at home. In 1997-98, the Asian financial crisis forced Korea under the tutelage of the IMF and greatly accelerated the casualization of the Korean working class which had been the main capitalist riposte to the breakthroughs of the late 1980’s. Today, at least 60% of the work force is casualized in the most brutal way, subject to instantaneous layoffs and half or less the wages and benefits of the 10% of the work force classified as “regular workers”. The bureaucratic remnants of the radical democratic unions of the early 1990’s are today reviled corporative organizations of that working-class elite, and as many struggles take place between regular and casualized workers as against capital itself. 1990 to 1994) radical democratic unions in the National Congress of Trade Unions (ChoNoHyop), committed at least verbally to anti-capitalism. under the tutelage of the IMF in exchange for a $57 billion bailout, with the IMF explicitly demanding casualization of labor and mass layoffs as part of its restructuring program. In December 1997 long-time democratic oppositionist Kim Dae Jong was elected president of Korea, and in February 1998 he brought the KCTU into the “historic agreement” to accept hundreds of thousands of layoffs and downsizings in accord with IMF demands, in exchange for full legalization. For window dressing, the Kim Dae Jong government in 1998 also established the Tripartite Commission of state, capital and labor along corporatist lines, a meaningless body which has acted, of course, only on behalf of the state and capital. In spite of this grim tableau and almost unending series of setbacks, the Korean working class has had to be beaten down step by step, with long, bitter strikes, and recent events show that this combativity is far from eliminated. former Hyundai CEO and mayor of Seoul, in the vain hope of a return to the expansive economy of the 1970’s and 1980’s. How the Korean working class went from offensive struggle and victory to casualization and retreat in a mere two decades, then, is the subject of this article. also note that, after the Iberian “transitions”, the subsequent explosions took place during a period of rollback and retreat in the North American and European working classes. international capital) tough austerity programs that fragmented the working-class movement. One might conclude that “democracy sells austerity” and that, indeed, is my conclusion. The Korean case, of course, has many specifics that should not be submerged in any general comparison. Nevertheless, Korea, one of the Asian “tigers” alongside Taiwan, Hong Kong and Singapore, stood out in the period 1960-1997 as one of a handful of success stories, set against the hundred failures and retrogression of Third World countries that were recipients of Western “aid” and IMF and World Bank tutelage. in South Korea after the end of the Korean War, tolerated statist development policies there that it routinely opposed or subverted in the rest of the underdeveloped world. Third, South Korea, poor in natural resources and flattened in the hostilities of 1950-1953, is the country par excellence of “human capital”, with a heavy emphasis on, not to say mania for education. Even in 1960, there was 90% adult literacy, hardly the case in then-comparable Third World countries. The country was divided at the 38th parallel in 1945 by the occupying armies of the U.S. and the Soviet Union. The defeat of Japan in World War II ended 35 years of Japanese colonial rule, the latter having been an important moment in laying the foundations of a modern capitalist economy (the exact legacy of this period is controversial to this day). than from sheer necessity of producing the basics of daily life. This system of workers’ councils was duly shut down by the U.S. occupation authorities in December 1945.
zone in five years of partisan warfare and massacres prior to the outbreak of the war with North Korea in June 1950. Whatever remained of a serious left in 1950 was physically eliminated during the war years or fled to the North (where many of them were also eliminated). The continuity with the pre-1945 Korean left in the south was entirely broken, a factor that played no small role in the reawakening that began in the 1970’s. Rhee Syngman ruled a generally inept, economically stagnant South Korea until 1960, propped up entirely by American military support and aid. He was finally overthrown in riots led by students in 1960, and South Korea enjoyed a brief democratic opening. This opening was closed again by the coup d’etat of Park Chung-hee in 1961, and a new era began. Park Chung-hee was not, or at least not only the typical American-supported two-bit puppet dictator of the post-World War II period. He is widely believed (though to my knowledge no definitive proof has come to light) to have been a Communist as early as 1943, and in 1948 he was arrested as part of a Communist study group of young officers. When he seized power in 1961, the U.S. initially hesitated to recognize him, and several times during his dictatorial rule (1961-1979) the U.S. distrusted his nationalist impulses (as in his independent nuclear power program) and his occasional diplomatic flirtations with North Korea. written by a Korean jurist who studied law in Germany in the 1950’s, and who became enamored with the theories of Carl Schmitt; hence “state of emergency” was a cornerstone of Park’s ideology. Ahn Ho Sang, who had been openly pro-Nazi in the 1930’s and had studied in Germany in the Hitler period, wrote the postwar high school history manuals with the kind of hyper-nationalist mythmaking inherited from German romantic populism. More fundamentally, Park cracked down on the parasitic capitalists of the Rhee period and either eliminated them or dragooned them into productive investment. He implemented the “New Village” (Se Maul) policy in the countryside, designed to fully capitalize agriculture and force large rural populations into the cities and into industrial employment. Through the Cold War anti-Communist Federation of Korean Trade Unions (FKTU), the regime exercised a draconian control over labor, with seven-day, 12-hour shift work weeks not untypical, and enforced when necessary with police terror and torture. During the Park era, the famous chaebol (conglomerates) rose to pre-eminence, under state control of credit and selection of “national champion” industries, the practice later denounced as “crony capitalism” when the Korean economy ran into trouble in the 1990’s. capturing important world markets for computer components by the 1990’s. The economic success of the Park chung-hee decades, obviously, cannot be separated either from his dictatorial methods or from the international conjuncture of the time (two realities widely overlooked today in debates about South Korea’s mounting economic problems; the December 2007 victory of the hard right in the presidential elections drew on a nostalgic, rose-tinted view of the Park era). In addition to benefiting from its high profile in U.S. Cold War geopolitical strategy, the South Korean economy also rode the growing wave of industrial investment which, beginning ca. 1965, began to search for venues outside of North America and Europe. Remuneration of Koreans abroad also played a significant role, as South Korean troops repatriated millions of dollars from service in the Vietnam War and tens of thousands of South Korean workers went to the Middle East to work on construction projects in the post-1973 oil boom. Given the centrality of light manufacture in the 1960’s “takeoff” period, then, the rebirth of the Korean working-class movement not accidentally began in the textile industries, and also not accidentally (since the work force was predominantly made up of young women) led by women workers. The contemporary Korean workers’ movement marks its symbolic beginning from November 13, 1970, when Jeon Tae-il, a young textile worker, immolated himself at a small demonstration in one of Seoul’s sweatshop districts. Jeon had previously pursued every legal form of redress for the sweatshop workforce, to no avail. The movement of the 1970’s was characterized by a rising number of strikes conducted in the most extreme conditions by women textile workers. The demands were simple and straightforward, aimed at the inhuman working hours, low wages, authoritarian foremen and enforced dormitory life of the women, who were generally recruited directly from the countryside and from the shantytowns that sprang up around Seoul and other cities. The strikes were met almost without exception with brutal repression by factory security personnel, police, soldiers and hired thugs from the Korean underworld. The struggle for a democratic union at the Dongil Textile Company in Inchon from 1972 to 1976 was exemplary in this regard. The 1970’s also saw the beginnings of involvement in the workers’ movement by (mainly Christian) religious groups and radical students (the latter known as “hakchul”, or “coming from the university”). The religious groups were inspired by Catholic liberation theology and similar Protestant social doctrines. The religious groups and students formed night schools for textile workers, teaching literacy and secretarial skills but also basic workers’ rights. of forced-march modernization, and attempted to utilize it in the creation of a “counter-culture of struggle” using music and dance from Korean shamanism and rural peasant traditions, creations that were successful in solidifying group determination to struggle against very heavy odds and repression. To this day, singing, reminiscent of the American IWW, remains an important part of the Korean workers’ movement, with demonstrations and strikes singing dozens of songs that everyone knows by heart. toward democracy. All this changed with the Kwangju uprising and subsequent massacre of May 1980.
hand, was from the southeastern Gyeongsang province, and his industrial policies were primarily directed there, giving rise to the major centers of Ulsan, Pohang, and Pusan. The people of Cholla province resented this neglect. allegedly after an argument about how to contain and repress the demonstrations. with weapons taken from a military armory, and fought the forces of repression, including an elite unit withdrawn from the DMZ with North Korea, for days. Estimates of the total dead on both sides (most of them obviously from the repression of the revolt) in Kwangju run as high as 2000. Kwangju was sealed off and extreme censorship prevented any serious information from leaking out. (Korea’s draconian National Security Law, dating from 1948 and still in effect today, made it a serious crime, well into the 1990’s, to discuss the Kwangju uprising in public.) .It was, however, widely believed that the U.S. government, smarting from the recent overthrow of the Shah of Iran in 1979, in the midst of the Tehran hostage crisis, and wanting no more mass radical movements against pro-U.S. dictators, had been deeply involved in the decision to use extreme force (a belief greatly strengthened by more recent disclosure of documents on government-to-government communication during the crisis). From that point onward, the Korean movement shifted quickly away from the liberal democratic and religious ideologies of the 1970’s to a more radical, essentially “Marxist-Leninist” orientation to revolution. through a glass darkly in South Korea. (In the early 1980’s, a clandestine study group formed to read Lukacs’s and Hegel’s writings on aesthetics—in German—and was discovered; its members were sentenced to six months in prison.) As a result, the radicalization of the Korean movement after Kwangju proceeded almost invariably along Stalinist, “Marxist-Leninist” lines, pro-Soviet, pro-China, pro-North Korea, but Stalinist across the board. Trotsky was little known until the late 1980’s, to say nothing of left-wing critiques of Trotsky. strengthened this nationalist impulse. Finally, myths of ethnic homogeneity, furthered by mythic populist history textbooks or more recently historical dramas on television about eras of Korean greatness, complete the picture. (A different, even more virulent version of this nationalism is promoted in North Korea.) In this context, even sports events, such as the 1988 Seoul Olympics or the successes of the Korean team in the 2002 World Cup playoffs, become events in the forging of national identity. For the same geopolitical reasons, any emergence of serious class struggle in South Korea immediately takes on an international dimension. Nationalism was hence unquestioned in the revival of the left in the 1970’s and 1980’s. As a Stalinized “Marxism” pushed aside the pre-Kwangju liberal democratic orientations of activists in the course of the 1980’s, the dominant imports were variants of Lenin’s theory of imperialism, monopoly capital theory and dependency theory, popularized by the Marxist-Leninist groups and by influential underground journals. The 1980’s also saw the acceleration of the hakchul movement into the factories, as widespread as any comparable “turn to the working class” in Western countries by middle-class radicals after 1968. At the peak of the movement, thousands of ex-students had taken factory jobs, and on occasion even led important strikes. reinforced by the fact that South Korea only caught up with and surpassed North Korea economically ca. 1980. The convergence of all these factors meant that the 1991 collapse of the Soviet Union, coinciding as it did with the downturn of the workers’ struggles after 1990, took a far greater psychological toll on militants in Korea than anywhere in the West, where the prestige of the Soviet Union had been deflating since at least 1956 and certainly since 1968. The mood had already turned bleak in the spring of 1991, when a Seoul student was beaten to death by police and the democratic left candidates were crushed in the June 1991 municipal elections, as if to underscore a sense of defeatism and futility after years of mobilization and struggle. It could be added that the Korean economy, in a boom phase in the 1986-88 period and the first phase of the Great Workers Struggle, had entered new difficulties by 1990, difficulties from which it has never fully recovered. Very much like comparable developments in the west after the late 1970’s, thousands of activists gave up, withdrew into private life, attempted to pursue middle-class careers or, in academia, succumbed to the allure of post-modernism. A discussion of the political backdrop to the course of class struggle is also indispensable. Beginning in the 1980’s, worker struggles for democratic unions shifted (along with the Korean economy itself) from light to heavy industry. The Chun Doo Hwan military dictatorship that succeeded Park chung-hee was forced to relax controls in the mid-1980’s, under mounting pressure from the broader democratic opposition in the run-up to the Pan-Asian Olympics (1986) and the Seoul Olympics (1988). In particular, the “democratization declaration” of June 1987, made in response to the threat that the working class would join in the pro-democracy protests, was the immediate trigger for the Great Workers Struggle of that summer. For the first time, the movement shifted from the Seoul-Inchon region to the new southern industrial zones of Ulsan, Masan and Changwon. All told, there were more than 3,000 strikes in 1987, winning unionization, 25-30% wage increases, and abolition of the hated military discipline (enforced hair length, mandatory morning exercises) in factories. Ulsan, in particular, the Hyundai company town, saw massive street mobilization and street fighting that lasted into 1990. The ebbing away of the mass offensive struggles of the 1987-1990 period, and the general atmosphere of defeat that ensued, opened a new phase in Korean worker organizations. The wage increases won in the late 1980’s briefly reinforced the illusion of the possibility of capital-labor cohabitation, and hence the reformist currents. In particular, within the National Congress of Trade Unions (ChoNoHyop), the right-wing and openly reformist (pro-North Korean) National Liberation faction began to gain the upper hand against the weakened radical faction. (The Korean name of the NL faction, Kukminpa, means literally ‘Labor together with the nation”.) This faction was always oriented to bureaucrats and politicians. As mentioned earlier, a government policy of repression aimed at the best militants in the NCTU and promotion of the open reformists destroyed the NCTU by 1995 and led to the regroupment in the KCTU under the right-wing leadership. (Indeed, at the very founding of the NCTU in January 1990, most of its leaders were in jail or in hiding.) The long experience of dictatorship and cronyism also made some workers initially sympathetic to bourgeois democracy and neo-liberalism. Ulsan remained in intense ferment, however, and in June 1991, when Park Chang Su, a labor leader, was killed in prison, 20,000 HHI workers and 30,000 HMC workers attacked Ulsan City Hall, with the struggle ultimately lasting one month. In 1992, South Korea joined the International Labor Organization (ILO), just about the same time that the capitalists were regrouping for a crackdown on wage gains. In this period, lower-wage public sector workers started to organize, the Korea Telcom (KT) workers being the most militant, even if their struggles tended to be mainly wage-focused, though linked to a push for workplace democracy. In 1993-1994, debate raged in the movement about the way forward, including a felt need for political strikes. The more radical currents wanted to shift the unions from company-based unions (the dominant form of Korean unions to this day) to industry-wide unions, and to create an umbrella organization. As the NCTU further declined under the blows of repression and the machinations of the NL faction, the way was open to the creation of the KCTU, formally created (though not legalized until the IMF crisis) in November 1995. Some successful strikes continued in 1995-96, notably a KT strike, that won major wage gains. Because of such strikes, blue-collar wages were surpassing civil service wages. At the same time, Korean employers were increasingly shifting from the chaebol model to an orientation to the advantages of globalization. Both sides were gearing up for the 1996-1997 confrontation over the labor casualization law. In the fall of 1996, rank and file pressure as well as preparation for a general strike grew. Under this pressure, the KCTU had to withdraw from discussions leading to the infamous Tripartite (state-labor-capital) Commission, which, once again, would be created in the midst of the IMF crisis in spring 1998. There was growing rank-and-file rejection of the NL group. shadow power both within the unions and with “horizontal” ties to militants in other unions, fighting against a trend to company-based parochialism. The arc of the hyung-jang jujik extended from 1990 to 2005. In different circumstances, the hyungjang jujik managed to take power in major unions and thereupon often succumbed itself to bureaucratization; in their final years, they became prey to various groups seeking a back-door route to power in the unions, and finally collapsed. But at their best, in a generally defensive situation, they preserved a continuity with the radical impulse of the 1987-1990 period. confrontation with the newly-won working-class power. The KCTU, firmly in the hands of the right-wingers who had defeated and displaced the NCTU, called an immediate general strike under intense rank-and-file pressure, a general strike which was widely followed. Even the conservative, Cold War-era “yellow” FKTU joined in. White-collar workers joined as well, and at its peak three million workers were on strike. (The initial legislation was withdrawn, but a virtually identical law passed in March 1997, with no significant reponse from the KCTU.) Again, the historical experience of the Korean working class and the novelty of casualization made the strike more “anti-fascist” than anti-neo-liberal. The KCTU did everything in its power to avert a confrontation with the government, and actively demobilized where it could. The rank-and-file, for its part, showed great spontaneity, such as at Hyundai and Kia Motor Company. The KCTU was rumored to have met secretly with the capitalists to assure them that the strike was under control, and waning. They proposed the impotent tactic of the “Wednesday strike”, a tactic repeated again and again in later years. The general strike petered out in late January, with (as indicated) nothing resolved. In the wake of the general strike, the Korean Democratic Labor Party (KDLP, or Minju Nodong Tang) was founded in spring 1997, with the same right-leaning elements dominant in the KCTU majority. The failure of the general strike of January 1997, however, was in turn eclipsed by the devastation of the Korean economy during the Asian financial meltdown of 1997- 1998.
to implementing the IMF’s draconian package of layoffs, cutbacks of government services, the leveraged and deregulated foreign buyout of Korean industries and banks, and the casualization of labor. Korean democracy, like Korean organized labor before it, triumphed at the very moment when the fulfillment of its earlier apparent promise became impossible, and triumphed as the necessary fig leaf for such harsh medicine. Bankruptcies cascaded and suicides skyrocketed. The IMF initially demanded that Korean banks lay off 50% of their personnel (the figure was later lowered to 30%) and similar numbers of civil servants. The unemployment rate tripled by 1999, and millions were thrown back into poverty. In this situation, Kim Dae Jong and the KCTU played their appointed roles. As previously mentioned, Kim pulled the KCTU leadership into the February 1998 Tripartite accords, with the KCTU assenting to mass emergency layoffs. The KCTU rank-and-file revolted against such abject surrender and ousted the leadership that had signed off on the deal. There were some large-scale strikes against layoffs in 1998, such as the Hyundai Motor Company (HMC) strike, but the new top KCTU officers were imprisoned and the strikes generally defeated. During the IMF crisis, many small factories were wiped out, including ones with a militant work force originating in the late 1980’s strike wave and previously sympathetic to the NCTU. For the first time, in keeping with IMF demands, contingent workers became a major phenomenon in the Korean work force. . In response to the imposed sell-off of Korea Telcom shares to Wall Street investors, for example, a strike erupted. This strike showed growing evidence of the rift developing between regular and casual workers. In addition to drawing higher pay for less work, the older regular workers lacked the computer skills of the young casuals, and felt increasing job insecurity. The union leaders talked tough but did nothing. Ultimately, both regular and casual workers did strike, but not at the same time. The KT strike ended with the dismissal of 10,000 casual workers. The February 1998 agreement between Kim Dae Jong and the right-wing leadership of the KCTU for mass layoffs led to a rank-and-file revolt in the KCTU, and the entire leadership was ousted after worker militants occupied the KCTU offices armed with steel pipes. A new left-wing leadership took control, as mentioned previously, and did attempt to relaunch a general strike against the new labor law in May, June and July, but to no avail. The old leadership remained entrenched in the heavy industry unions, and opposed militant action. In June-August 1998, a 28-day strike took place at HMC, leading to the firing of 10,000 regular workers. Within two years, 10,000 casuals had been hired to do their jobs. KT and various banks also fired regular workers and rehired them as casuals. As early as 1999, a 32-day nationwide strike of 4000 tutors of the Jaenung schools (hakwon, or private academies for after-hours schooling) won collective bargaining rights. The government had denied that they were workers, calling them instead “independent contractors”. The strike was important in showing that organizing casual workers was possible, against state and employer resistance. In 2000-2002, a renewed KT strike lasted 517 days. In the aftermath of defeat, the KT casual workers union was dissolved. The regular KT workers were generally hostile to the irregular workers. After the strike, KT hired people as “indirect contract workers”. In 2002, 49% of KT shares were sold to US investors, with increased severance pay packages as a tradeoff, along with shares given to regular workers. In 2000-2001, an air-conditioner factory strike lasted over a month, and was betrayed by the regular workers, over and against casual worker militancy. A counter-example, however, was the Lotte Hotel workers organizing drive in 2000, which showed that a regular workers’ union could in some circumstances organize irregular workers. After tremendous repression by the hotel owners and imprisonment of strikers, the hotel agreed to regularize workers over a two-year period. During these same years, however, the KDLP was shifting to the right, and the dominance of the NL line, oriented to the bureaucrats of the KCTU and the politicians of the KDLP, prevented organizing casual workers. (In 2004, the KCTU even helped a Hyundai CEO in his electoral campaign as an independent.) The KCTU was an integral part of neo-liberalism, enforcing outsourcing. In 2003, for example, Pusan truck drivers successfully pulled off a strike, but the government, employers, KCTU and KDLP sabotaged it. In the same year, a large strike erupted at the LG Caltex (now GS Caltex) refinery, but the KCTU did nothing to help the strikers. In 2005, 10,000 casual oil and chemical workers in Ulsan struck for 83 days over working conditions. The complicated hiring structure imposed by labor laws and company strategy hobbled the strike. A “Committee for the Ulsan Area” was created to settle, including capitalists, CEOs, smaller businessmen, NGOs, and the Ulsan branch of the KCTU. An agreement was limited to the recognition of the union. The workers returned to work during six months of committee “discussion”, leading to nothing. The return to work was brought about by small company concessions, but after the KCTU and KDLP withdrew from the scene, no part of the agreement was ever implemented. Over the summer of 2005, a battle raged again at Ulsan HMC over casualization. One worker immolated himself in protest, and the union refused to link his death to the labor situation. The casual workers tried to stop the assembly line, but the regular workers refused to collaborate. Company managers and scabs restarted the line while the regular workers stood by, doing nothing. All casual workers involved in the struggle were fired. In June 2006, the metal workers union voted to form an industrial union of in attempt to overcome the fragmentation of workers in the myriad of spinoff subsidiaries with different contracts, but HMC still negotiates with the HMC company union. Many militant workers opposed the industrial union initiative because of its corporatist agenda. Later that summer the casual construction workers of the giant POSCO steel works in Pohang wildcatted and were defeated. In August 2007, the casual workers of Kia Motor Company wildcatted and occupied part of the factory, where they were physically attacked by the Kia regular workers and forced back to work. In one positive development, in November 2007 regular and irregular workers of Hyundai Motor Company in Ulsan for the first time organized a rank-and-file movement together. 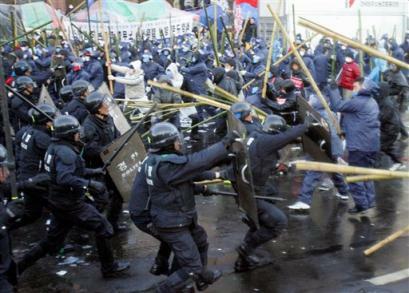 The still-ongoing (as of this writing, January 2008) E-Land strike is the latest and in some ways the most important struggle of all in placing the question of casual workers front and center in South Korean society. In November 2006, the Korean government passed yet another in a series of laws on casual labor, called in Orwellian fashion the Casual Worker Protection Law. The law was designed to create the illusion of “doing something” about a condition now affecting over 60% of South Korea’s active population. The law provided that after two years on the job, all workers would automatically become regular workers. The law went into effect seven months later, on July 1, 2007, and left huge loopholes for employers who wanted to lay off casuals before the deadline. Some companies complied with the law, but many more did not and laid off their casual workers by June. The whole process came into sharpest focus at a chain of department stores known as E-Land, with a related struggle at a similar chain known as New Core. E-Land had begun as a small family business, under a fundamentalist Christian owner, and had grown to a $58 billion annual enterprise with 61 outlets around the country. It had taken over the stores of the French Carrefour chain. The company was known for particularly harsh conditions of employment, with mainly women casual workers earning $800 per month for 36-hour weeks, often compelled to work 12-hour shifts without even bathroom breaks. Further, the company required all employees, Christian or not, to attend chapel on the premises. The CEO of E-Land tithed $100 million to his church in 2006. Just before the new law went into effect, E-Land and New Core laid off 1000 workers who would qualify as regular workers under its provisions. The immediate response was a strike now (January 2008) in its seventh month, and holding firm. In the initial days of the strike, all over South Korea, thousands of casual workers from other sectors came to help shut down E-Land stores. The KCTU went into action, doing everything to smother the strike under fulsome rhetoric while diverting the energies of the rank-and-file and “outside” supporters into meaningless symbolic actions. On July 20, however, 200 E-Land employees occupied an outlet in Seoul and shut it down. The government response was to send 7000 soldiers, police and hired company thugs to violently oust and arrest 200 people. The fading Noh Moon Yon government (highly unpopular and due to leave office in February 2008) had a great deal riding on the success of the new law. But it was hardly alone in perceiving the importance of the strike. Many big chaebol came to E-Land’s assistance with millions of dollars of loans. The KCTU, for its part, promised to lend the E-Land and New Core unions serious money when their strike funds were exhausted by the end of the summer, then reneged on the offer. The KCTU constantly pressured the company unions to come to the bargaining table while E-Land management offered no concessions whatever. In Pohang, in November, E-Land even attempted to open a new outlet with only casual workers. 500 E-Land workers and other casuals not only blocked the entrance to the store, but attacked and disarmed the police and thugs protecting it. Similar actions, including blockages and store occupations, have occurred intermittently throughout the fall. Perhaps most remarkable in the E-Land strike, in contrast to many earlier strikes with casual labor as the main issue, has been the broad sympathy for and support of the strike among working people in the same casualized situation. A nationwide boycott had by December reduced sales nationwide by 30%, and even the media had given generally favorable coverage to the strike, at least in the early weeks. Whether the E-Land strike wins the strikers’ jobs back or not, it will be a victory for the broader working-class movement by finally making the casualization of labor in South Korea a question that can no longer be ignored. Bae, Kichan. Korea at the Crossroads. The History and Future of East Asia. Seoul, 2007. Brzezinski, Zbigniew. The Grand Chessboard. American Primacy and Its Geostrategic Imperatives. New York, 1997. Cho, Lee-Jay et al. eds. Institutional and Policy Reforms to Enhance Corporate Efficiency in Korea. Seoul, 2007. Cho, Lee-Jay et al eds. Regulatory Reforms in the Age of Financial Consolidation. Seoul, 2006. Cumings, Bruce. The Origins of the Korean War. Vol. I: Princeton, 1981. Vol. II: Princeton, 1990. Denis, M. et al. Suedkorea: Kein Land fuer friedliche Spiele. Reinbek bei Hamburg, 1988. Graham, E. Reforming Korea’s Industrial Conglomerates. Washington DC 2003. Harris, N. The End of the Third World. London, 1986. Hart-Landsberg, M. et al. Marxist Perspectives on South Korea in the Global Economy. Hampshire (UK), 2007. Hwang, B-D. Nachholende Industrialisierung und autoritaerer Staat. Berlin, 1989. Kang, Su-Dol. Fordismus und Hyundaismus. Frankfurt a.M. 1995. Kim, San/Wales, N. Song of Ariran. New York, 1941. Kim, S./Shin, D.C. Economic Crisis and Dual Transition in Korea. Seoul, 2004. Kim, W./Kim, P.S. Korean Public Administration. Seoul, 1997. Jeju Development Institute/ East Asia Foundation. Building a Northeast Asian Community. Vol. II. Seoul, 2006. Jeong, Seongjin and Shin, Jo-Young. “Debates on the Economic Crisis within the Korean Left.” in Rethinking Marxism, vol. II, No. 2, Spring 1999. Jomo, K.S. Tigers in Trouble. Financial Governance, Liberalisation and Crises in East Asia. London, 1998. Kim, Kyeong-won. Post-Crisis Transformation of the Korean Economy. A Review from 1998 to 2002. Seoul, 2003. Kirk, D./Choe, S.H. Korea Witness. Seoul, 2006. Kirk, Donald. Korean Dynasty. Hyundai and Chung Ju Yung. Hong Kong, 2000. Koo, Hagen. Korean Workers. The Culture and Politics of Class Formation. Ithaca, 2001. Korean Naitonal Commission for UNESCO. The Korean Economy: Reflections at the Millennium. Seoul, 2001. Lee, B-H. Verfassungs- und gesellschaftspolitische Konzeptionen und ihre Verwirklicung in der Dritten Republik Koreas (1963-1972). Jacobs, Norman. The Korean Road to Modernization and Development. Urbana, 1985. Moon, C. and Steinberg, D. Korea in Transition. Three Years under the Kim Dae-Jung Government. Seoul, 2002. Ogle, G. South Korea: Dissent Within the Economic Miracle. London, 1990. Park, Min-na. Birth of Resistance. Stories of Eight Women Worker Activists. Seoul, 2005. Scalapino, R. and Lee, Chong-sik. Communism in Korea. Vol. I. Berkeley, 1972. Sun, Hak Tae. The Political Economy of Democratic Consolidation. Dynamic Labour Politics in South Korea. Kwangju, 2002. Socialist Political Alliance. Marx/ Revolution. Papers of the SPA International Conference in Seoul and Ulsan, October 2006. Seoul 2006. Suh, D-S. The Korean Communist Movement, 1918-1948. Princeton, 1967. West, J. A Critical Discourse on Korean Law and Economy. Pusan, 2002. Woronoff,, J. Asia’s “Miracle” Economies. Seoul, 1986.